It’s a $60 game release — although you can, of course, pay much more — that’s made up of three different games with only a few mechanical similarities between them. There is no way to purchase just one game, you have to grab the bundle. And each game could operate as its own service, with ongoing updates and new content. Other companies may have been tempted to break them up or release at least one as a free-to-play game, but not Activision. The bundling strategy is nothing if not confident. The multiplayer does get some narrative direction from the Specialist HQ, which serves as a good training ground for each of the multiplayer characters. Their introductory missions are laced with story cutscene. The story Specialist HQ tells is a little hard to follow, as there’s no specific order for the Specialists, but it’s neat nonetheless. Zombies also include two storylines, though those are definitely harder to follow than a normal campaign because the story of each map is hidden behind Easter egg challenges. My attempts at piloting the vehicles in Blackout mostly led to disaster, but the snappy ATV is by far my favorite, handling best with a controller, though I switch back to keyboard and mouse once I’m back on foot. It’s an easy way to zip up to an unsuspecting player without making yourself too much of a target, which is always a concern with battle royale vehicles. While it can be tough to tell when you’re packing a new weapon every game, the recoil patterns on the various rifles seem far more consistent than in previous games, which makes it easier to precisely blast down foes at mid-range. This left me relying on the slow-firing Rampart and a whatever shotgun I could find, rather than my CoD standby of the SMG-and-sniper combo. My trusty combo feels a bit ill-suited for the unpredictable open-field nature of most Blackout battles. Fans of battle royale games will instantly recognize the basic setup. 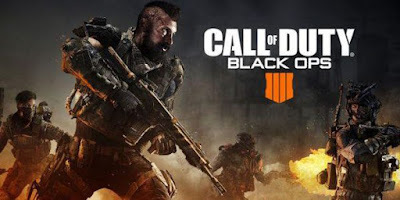 There is a damage-dealing circle that shrinks to dictate the intensity and direction of the fighting, and you still parachute — or in Blackout’s case wingsuit — down to the surface of an abandoned island full of supplies and firearms. But the way it’s played and how it feels is unique, letting Treyarch carve out its own space in the market. For one, Blackout is much faster paced. You die quicker, run faster, and fight in much more intense and quickened bursts of action. You can also heal and revive in just seconds, making these battles much more frenzied and long-lasting if you’re strategic and crafty enough. There are ground vehicles, like trucks and quad bikes, that let you get inside the next circle faster. There’s also a helicopter that allows you to circumvent the entire map in mere minutes to find the best position. You can even wingsuit from tall structures down to the surface, making long-distance fighting atop skyscrapers and bridges more appealing. Blackout also adds quite a few features from the main multiplayer mode, including mechanical grappling hooks, deployable shields, and RC cars for remote scouting. In previous Call of Duty games, I could more often than not expect to be in the upper half of the pack, while now I’m finding myself closer to the bottom. And as much as I enjoy occasionally helping out the team with a sensor dart or two, I’m clearly far more of a detriment.